FOCUS St. Louis® has selected 31 talented young professionals for the Fall 2018 cohort of Emerging Leaders. This competitive program provides participants (ages 22-35) with an increased sense of engagement in the region, as well as the tools to take an active role as the next generation of St. Louis regional leaders. 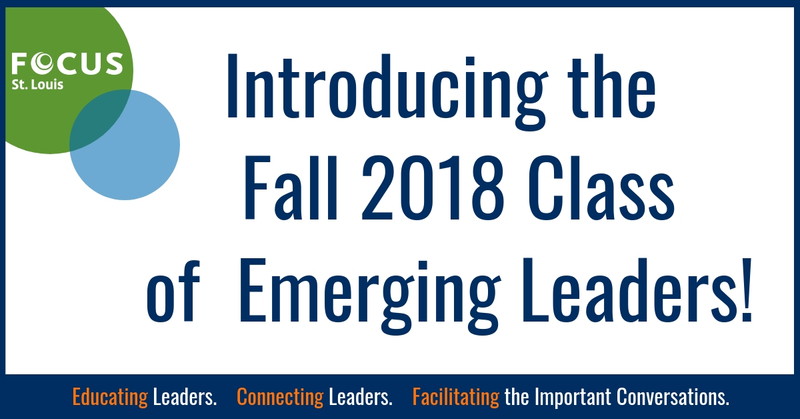 Since its launch in 2012, the FOCUS Emerging Leaders program has trained more than 350 young professionals from across the public, private and nonprofit sectors. The fall cohort will be the first to participate in the newly expanded format, which includes a two-day opening retreat, group Civic Action Project and seminar days around the region for a total of 40 hours of civic leadership development. Over the course of the three-month program, Emerging Leaders develop a better understanding of the inner workings of the St. Louis community, explore their personal, professional and civic leadership styles and gain a diverse network of peers. Upon graduation, participants become part of the FOCUS network of more than 8,500 leadership program alumni.